autocaredepot has no other items for sale. There are 421 items available. Please enter a number less than or equal to 421. Sales tax may apply when shipping to: CA(9.0%), IN(7.0%), IA*, MN*, NJ(7.0%), PA(6.0%), WA*. As advertised with quick shipping. I wanted a generator that was light enough to lift without assistance and place in the back of my side by side when I use my electric tree trimmer. It is very easy to start and most of the time it only takes one pull. The first time I ran it I thought it must be in the eco mode because it was so quiet. When I flipped the eco switch it was even quieter. It runs my electric chainsaw just fine and as a test I ran an electric heater using a power meter and could see it could supply 1500 watts without a problem. 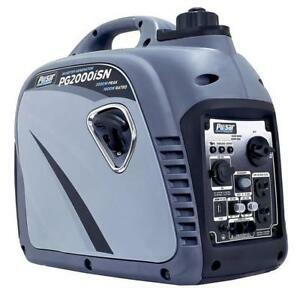 I have a larger generator that works great but is just to heavy to lift so I can see where I will probably get a lot of use out of my new pulsar. This generator continues to amaze me. Easy to start and maintain, sips fuel and is very versatile. I've been using to power a commercial fan and hand tool battery charger for at least 15 hours on one tank full. The fan is so large it will over load at start up, but by turning on and off until it is turning near full speed, it operates just fine. Excellent portable generator. Buy with confidence. It is too new to tell if the longevity is there so I did not rate "quality". I am greatly disappointed that there is no gas shut off valve therefore carburetor stays full of gas which is not desirable for long-time sitting without use.